This article is about water damage or water damage restoration if you would like to call it that. Well, it is absolutely pouring here in Las Vegas today and it doesn’t look like it will be letting up soon. We even have snow in the forecast as well. I’m assuming that there will be plenty of calls to Las Vegas Environmental Pros in regards for water damage restoration. Especially if there is snow, that will bring a whole new element to water damage clean up as the snow will add weight on to surfaces like roofs that are not used to that causing leaks. Floods here in the southern Nevada area happen very fast as the ground is so dry and baked solid from the sun that it doesn’t allow water to soak into it. The ground actually acts as a slippery surface that moves water even faster. This can cause substantial water damage to properties that are near the flooding water. In the process of doing a water restoration job it is most important to cut off the source of what is causing the water damage. Whether it is a leaky piece of plumbing or water rushing in from outdoors, the water source must be dealt with first. It becomes obvious that if it is a plumbing issue you could simply shut off the main water line in order to stop further water damage. However, if it is due to a crazy desert storm, items like sandbags may have to be put into strategic areas to cut off the source of the flood and assist with the water damage restoration process. 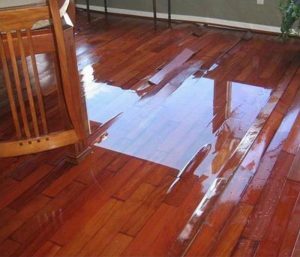 Water damage and the water damage restoration process is one of the biggest messes to clean up as the water ruins just about anything in its path. If you think about it, the water will ruin important papers, short out electrical systems and computers, fabrics and pieces of furniture and all of your flooring and walls as well. Replacing those sentimental items due to water damage is not an option. Some of the furniture and other items may be saved during the water damage restoration process but that is not always guaranteed. During water damage restoration, the first line of business is to stop the water from entering the damaged area. Once the source of water is contained, now the drying out process can start in the areas that suffered from water damage. This is usually done by opening up doors and windows creating an air flow along with the use of large commercial grade fans. Moving the air will assist in drying out a property that has intensive water damage. It is also recommended that you use a professional water damage removal company like Las Vegas Environmental Pros to make sure that the water restoration job is done correctly. There are so many different problems that can occur with water damage that it is important that you have the professionals overseeing your project every step of the way. Water damage is serious and you should always take the appropriate steps to take care of your property.